The “Saturday Night Live 40th Anniversary Special” celebrated four decades of a New York City institution. WorldStage, an almost equally long-lived New York institution, offered its congratulations and technical support to its long-time customer by providing U3 LED videowalls and various lighting fixtures for the red carpet event and the “SNL” studio. A projection of the SNL logo on the Rockefeller Center. With a 36-year history of supporting “SNL,” “It was great to be there with them to mark their 40th anniversary,” Weisberg said. 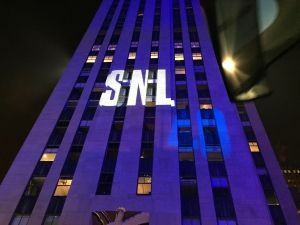 For the 60-minute “SNL 40th Red Carpet Live” show, hosted by Matt Lauer, Savannah Guthrie, Carson Daly, and Al Roker from Rockefeller Plaza, WorldStage provided two U3 3.75mm videowalls plus lighting for the host positions. WorldStage recently made a big investment in U3 display technology, purchasing more than 700 tiles for its inventory. In the “SNL” studio, WorldStage furnished Clay Paky Alpha Profile 800 ST, Clay Paky A.leda B-EYE K20s, Martin MAC Aura, GLP Impression X4, and Rosco Miro Cube 4c lighting fixtures for both music stages. WorldStage also supplied video for Paul McCartney’s set. Geoff Amoral and Rick McGuiness were the lighting directors.